This entry was posted in PRESS on November 5, 2017 by rit.premnath. This entry was posted in PRESS on June 5, 2015 by rit.premnath. This entry was posted in PRESS on June 3, 2015 by rit.premnath. This entry was posted in PRESS on August 11, 2014 by rit.premnath. The original text appeared here. It is with great sadness that we hear of the passing of Otto Piene on July 17, 2014. We are grateful to have had the recent opportunity to interview Mr. Piene about the historic exhibition that he organized at ICA fifty years ago. ICA@50 ends with a reverse countdown to the organization’s very beginnings: the “zero zone” described by Otto Piene as a “zone of silence and pure possibilities for a new beginning.” A film by Korean artist Jeamin Cha accompanies this archival reflection on ICA’s Group ZERO exhibition. A small catalogue and a few photographs are all that remain in the files for the historic Group ZERO exhibition at ICA. In an effort to rebuild the institute’s archive, I visited Otto Piene (b. 1928, Baad Laasphe, Germany; lives Groton, Massachusetts) at his residence to speak with him about his experience of organizing the show fifty years ago at the fledgling art museum. This interview is available for viewing in the gallery and on ICA’s website where select clips act as prompts for a collaborative text written with the artist Sreshta Rit Premnath (b. 1979, Bangalore, India; lives New York). 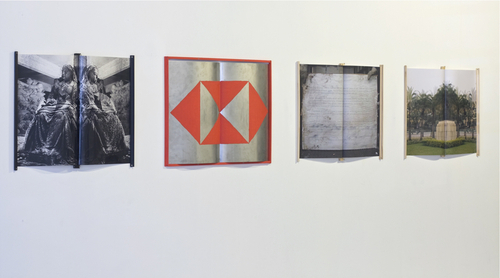 Artist and editor of Shifter magazine, Premnath recently presented a solo exhibition Knot Not Nought, which explored the concept of the zero knot in mathematical, poetic, and philosophical terms. On view in the following pages, the text explores how Group ZERO’s and Piene’s interests remain relevant today. Sreshta Rit Premnath: I don’t think that this state of perpetual war is purely psychological. Having lived in the US for over fifteen years now, I find myself in a country that is constantly at war elsewhere. In such a situation, inaction is tantamount to our complicity with war at a distance. These wars are fought because of American “interests” in other countries, and we cannot opt out of global politics. We are bound to the factory worker in China through our cellphones, the textile worker in Bangladesh through our clothes, and the oil-worker in Iraq through our cars. Inaction stems from two sources: the first is our inability to feel the violence of war at a distance; the second is a deep disenchantment with the democratic process that leaves the electorate feeling powerless and apathetic. LP: Let’s not forget the shifting scale of culture and politics. The introspection of a young soldier during World War II is an example of how world-scale conflicts and politics leave a real imprint on individuals on the ground. When it feels like that ground is pulled out from beneath us, we begin to question the arbitrary and unstable nature of the construction of our society, and of nation-states in general. One of the ways we can ground ourselves again is to construct a space of our own (real or virtual) in which to take refuge, even if only temporarily. Maybe that is the impulse behind the work of Otto Piene’s generation of artists. If we look beyond the immediate safety of our home here in the United States, the world is not any less violent today than during World War II. We have sophisticated means of distancing ourselves from the violence; and disenchantment with the democratic process, as you say, is rampant. The overwhelming sense of despair, however, should not automatically lead to apathy. When it feels like we’re being dwarfed by something entirely out of our control, like the large expanse of the sky, should we not shift our gaze towards the grains of sand at our feet? SRP: Liz, your feeling that Otto Piene and his contemporaries had to reinvent a ground from which to work pinpoints the importance of the sky for them. The sublime experience that Piene recounts, of looking at the sky, would provide a way out of the political particularity of where–or on whose ground–one is standing. By surrendering oneself to light and to the sky stretching over land and water, oblivious of the boundaries of nation-states, the artist finds a zero point from which to begin. However, it seems to have been important to Piene, and it certainly is for me, that this sublime invocation of zero not elide or conceal politics. I am echoing your desire to practice looking while also being mindful of how one looks. Piene’s absorption in the sky is always disturbed by the threat of bombers. What I wonder is how to use the sky to mobilize my political sentiments. Is it possible to feel the threat of drones while sitting in New York City? LP: I am skeptical of the mobilization of the sky in global politics. Recalling past conversations I have had with you and many others about the commodification of air space in New York City, and Amazon.com’s attempts to make drone delivery a reality in the near future, it seems, by no stretch of imagination, that the sky is the new frontier in late capitalism, and that economic interests will motivate intense political battles over air space. The sublime and transcendent beauty of the sky can be so easily instrumentalized by people on any side of the political spectrum, so the question of how to use the sky to mobilize your political sentiments, which I assume are much aligned with mine, feels urgent. SRP: We have already grown accustomed to aerial advertisements interrupting our enchantment with the sky. Proposals for moon publicity may some day become a reality, at which time even our “heavenly bodies” would be reduced to surfaces that promote our profit-driven world. What if we think of the sky not as the space above our heads but, instead, as that which lies beyond? The sky is the literal emptiness that fills the universe, stretching between stars and within atoms. Our recognition of the sky in this sense would give rise to the fundamental question of metaphysics, stated by Heidegger as: “Why are there beings instead of nothing?” Could an engagement with the world that transcends worldly problems establish a new politics of consciousness and attention? Or, are metaphysical considerations incompatible with political life? LP: I would like to hold fast to the idea that metaphysical reflections ought to make us question the fundamental nature of being, not so we can equate transcendence with escapism, but so that we can become better grounded in our own reality. If we think of the sky as that which lies beyond, then the ground is that which is within. One cannot exist without the other, and both are equally expansive spaces of exploration and questioning. LP: Many of Piene’s works such as the light ballet performances and sky art events evoke the space somewhere between the ground and the sky, making use of that space as a medium of suspension. OP: The balloon as a border-defying, innocent, lightweight, lighter-than-air thing took on a slightly political role in all of this. SRP: I would like to think of the balloon as empty space given a temporary form. The border that Piene speaks about could then refer to both the terrestrial boundary that this floating orb adamantly ignores, and also the subtle skin that separates the inside and the outside of the balloon. LP: As a symbolic object, the balloon epitomizes the transcendence of man-made borders. Perhaps like a message in a bottle, it’s a proposition to an unknown receiver. It can be so rife with symbolism and interpretation that I think at a certain point we also need to acknowledge that a balloon is just a balloon. As a physical form, the balloon is the thin membrane as well as the spaces within and without. Therefore besides being a discrete object, it points to an ecology of invisible forces that hold and embrace it. These forces sway us this way and that, much as they sway the balloon. This discussion makes me mindful of the porosity of my skin and the perviousness of my being. We can look at this permeability of boundaries politically. Circling back to the beginning of our conversation, we are connected to those far away from us to whom we owe our material comfort–our computers, phones, clothes, cars, etc. SRP: Perhaps it’s the sensitivity of the membrane that mediates the inside and the outside that counts. The co-constitutive zones of the personal and the political must be nurtured by remaining receptive, like a weather balloon, to relations with distant others. However, I don’t think we need to dispense with the metaphysical connotations of the balloon in order to engage with its political metaphors. While the balloon is a literal means of dispersing information, whether it be political fliers or advertisements, it is also a metaphor for the social forces that shape us. And finally, the balloon as a work of art allows us to consider being itself, floating untethered by material and social constraints. This entry was posted in PRESS on August 5, 2014 by rit.premnath. This entry was posted in PRESS on June 28, 2014 by rit.premnath. It all began with a phrase, “let sleeping dogs lie” and so, on a walk home late one night in Sanjay Nagar, artist Sreshta Rit Premnath found himself filming sleeping dogs. At the time, Premnath was engaged in another project. One that took as its point of departure the late industrialist MS Ramaiah’s belief that he could defy death by constant construction. “I didn’t know what to do with them but there was something about them that interested me,” said Premnath, who lives in New York city but returns to Bangalore, the city he grew up in, intermittently. The videos of dogs didn’t make it to the exhibition titled The Last Image held in Chicago in 2012 but they stayed with him nevertheless. Premnath’s solo show opens at GALLERYSKE on Sat July 13. This entry was posted in PRESS on July 9, 2013 by rit.premnath. This entry was posted in PRESS on December 22, 2012 by rit.premnath. This entry was posted in PRESS on July 1, 2012 by rit.premnath. This entry was posted in PRESS on March 5, 2012 by rit.premnath. This entry was posted in PRESS on February 26, 2012 by rit.premnath. Sreshta Rit Premnath. “Blue Book, Moon Rock,” 2009. Multiple media. Dimensions variable. Sreshta Rit Premnath’s over-arching project involves an investigation of scientific, philosophical, and aesthetic discourses in terms of the ways these discourses construct and dissemble our sense of the real. In Blue Book, Moon Rock, for instance, are arrayed multiple systems of measure and representation. One sees a sheet of paper on which is depicted a photograph of a moon-rock. Above the moon-rock is a measuring stick. In another document from the installation, one encounters a page from Wittgenstein’s “Blue Book” (one of the many philosophical journals the philosopher kept) entirely blacked-out except for the sentence: “We ought to talk further on about the meaning of ‘forgetting the meaning of the word.’” Following Wittgenstein, Premnath’s aesthetic universe provides his viewer with a vantage of the world from multiple “language games” (Wittgenstein’s term for particular modes of discourse), foregrounding the contradictions and dilemmas produced through this shifting vantage. (The journal Premnath has edited since 2006 appropriately enough is called Shifter, taking its name from linguist Roman Jakobson’s term for grammatical elements that help to establish a context for utterance, such as personal pronouns). This entry was posted in PRESS on January 21, 2012 by rit.premnath. This entry was posted in PRESS on November 5, 2011 by rit.premnath. “Several young Indian artists will be appearing in a California show called “The Matter Within: New Contemporary Art of India,” opening Oct. 15 at Yerba Buena Center for the Arts in San Francisco. Heres a link to the whole article. This entry was posted in PRESS on September 15, 2011 by rit.premnath. Tell us your history. How you started? I was born in Bangalore, India in 1979. My mother is an ecologist, my father is an acoustic engineer and I studied in a school founded by the philosopher J. Krishnamurti. I think this particular combination has contributed to an analytical bent in my art practice. In 1998, after high-school I moved to the US to study art. I moved to New York City about six year ago to complete my Master’s degree at Bard College and attend the Whitney Independent Study Program. This entry was posted in PRESS on July 16, 2011 by rit.premnath. This entry was posted in PRESS on June 27, 2011 by rit.premnath. This entry was posted in PRESS on March 1, 2011 by rit.premnath. This entry was posted in PRESS on February 19, 2011 by rit.premnath. Sreshta Rit Premnath’s exhibition “Leo (procedures in search of an original index)” (Galleryske, November 22 to December 4) focuses on metamorphoses of the lion as a symbol of power through its varied recurrence in historical and cultural contexts, its direct examination revealing a confusing, contradictory propensity to support as well as undermine its intention. The show oscillates between visual evocativeness and sensation as much as conceptual occasionally hermetic, strategies, some necessitating explanation if one is not familiar with American circumstances or technical references. This entry was posted in PRESS on November 15, 2010 by rit.premnath. As Shobha De so succinctly put it in a recent article in the Bombay Times, “Symbols are not instant coffee.” While this glam queen was referring to the new – and improved? – Indian Rupee symbol, we can safely say that in general, symbols take time to evolve, whether nationally or cross-culturally. Sreshta Rit Premnath ‘s show titled “LEO” explores and at the same time deconstructs the symbol of the lion – that grand old animal that forever lives (and falsely so) in our imagination as the king of the jungle. This entry was posted in PRESS on November 10, 2010 by rit.premnath. A new show investigates how the lion has slipped into our general consciousness and perhaps lost its majestic associations, says Jaideep Sen.
For his new solo show – titled LEO – at GALLERYSKE, the 30-year-old New York-based artist began to look at the many associations that the lion has come to assume over the years. As the numbers of the big cat in the world – of both of its two largest populations: the Asiatic and the sub-Saharan species – have dwindled to a few hundred, Premnath sought to explore the manner in which it has come to assume a solemn, and silent, presence in urban society, as elements in design and architecture that may well seem commonplace. This entry was posted in PRESS on November 4, 2010 by rit.premnath. This past week I received two packages in the mail. The first was from Arnold Kemp, who is an artist, curator, and teacher and currently directs the Visual Studies Program at Pacific Northwest College of Art in Portland. The second was from Sreshta Rit Premnath, an artist, writer, and curator, with whom I have been collaborating to construct an archive of video materials dedicated to the future anterior (the French conditional tense for what “will have been”). In both packages, I saw an affinity among the printed materials, all of which have to do with certain aporias of historical representation, cultural encounter, and aesthetic mediation. This entry was posted in PRESS on September 8, 2010 by rit.premnath. This entry was posted in PRESS on September 1, 2010 by rit.premnath. View of “Spectral Evidence,” 2010. “Spectral Evidence,” the first of two exhibitions curated by Steven Lam at 1a Space, features works by Lin + Lam, Sreshta Rit Premnath, and Simon Leung. The pieces in the exhibition use the media, materials, and language of documentation to create narratives that provoke us to question how we perceive the world. Premnath’s Horizon (all works cited 2010) is a group of photographs depicting various monuments to Christopher Columbus, but the statues themselves have been removed from the images, leaving only the pedestals. Alongside these altered pictures is a faux granite tablet bearing a line from the explorer’s journal that highlights the oft-present gulf between belief and reality: WE WENT SOUTH WEST UNTIL WE LEARNED THAT WHAT WE HAD THOUGHT WAS LAND WAS ONLY THE SKY. This entry was posted in PRESS on August 8, 2010 by rit.premnath. For its inaugural curatorial residency, 1a Space has invited Steven Lam, New York-based artist, curator, and educator affiliated with with both Cooper Union and the School of Visual Arts, to produce the first of two exhibitions: “Spectral Evidence,” which takes as its theoretical foundation the titular odd legal category first utilized in the seventeenth-century Salem witch trials and later picked up in theoretical texts on the Derridean concepts of haunting and the trace and Avery Gordon’s concept of ghostly presence. The idea certainly resonates in Hong Kong, where evidence of haunting due to violent death constitutes legal grounds for breaking property leases and where a major local artist, Adrian Wong, once turned a lengthy process of exorcism into an extensive project in the wake of a series of supernatural mishaps. Fortunately, Lam does not set out with such a literal interpretation of the context, instead working with two artists and an artist collective to construct narratives of forced migration, disappearing histories, and colonial power. This entry was posted in PRESS on June 12, 2010 by rit.premnath. This entry was posted in PRESS on August 19, 2009 by rit.premnath. Premnath’s Blue Book, Moon Rock, featured a photograph of a shadowy moon rock, a chalkboard, a screen print of the moon and a light projector. Propped on a wall, each object reavealed a different aspect of man’s relationship with the moon. The dusty blackboard reminded us of science projects at primary school, while the fraying photograph recalled old magazine articles celebrating America’s triumph in getting the first man onto the moon. These rational readings give way to more mysterious ones as we approached the shifting light cast by the projector onto softly gleaming silver-sprayed acetate. Was Premnath recreating the bewitching effects of moonlight? This entry was posted in PRESS on July 22, 2009 by rit.premnath. This entry was posted in PRESS on June 11, 2009 by rit.premnath. This entry was posted in PRESS on June 5, 2009 by rit.premnath. This entry was posted in PRESS on May 15, 2009 by rit.premnath. This entry was posted in PRESS on March 2, 2009 by rit.premnath. This entry was posted in PRESS on August 11, 2008 by rit.premnath. This entry was posted in PRESS on March 22, 2008 by rit.premnath. Galleryske, continuing its focus on bold, young art, presents Bangalore-born Sreshta Premnath who lives in New York. His exhibition, the “Black Box” (January 7 to February 15) from evidence of air crash becomes a metaphor of the current collapse of clarity in a globalising world. Human and object movements spontaneously change and muddle perception, positions and values, while deliberate manipulation of the same comes from economical powers and advertising imagery aided by technology. This entry was posted in PRESS on February 8, 2008 by rit.premnath. This entry was posted in PRESS on November 19, 2007 by rit.premnath. This entry was posted in PRESS on November 7, 2007 by rit.premnath. “Shifter, edited by Sreshta/Rit Premnath, is virtually unknown among writers because it’s not, strictly speaking, a literary journal. Its statement begins: “Shifter’s nature is such that it changes every issue. What worked in the previous issue doesn’t work anymore. What failed may be substituted with new deficiencies. This entry was posted in PRESS on January 21, 2007 by rit.premnath.